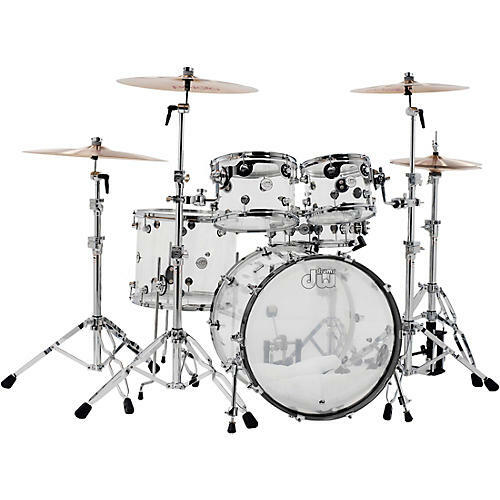 DW has taken their custom drum-making experience and infused it into professional, quality drums that set a new standard for quality and affordability. This Design Series Acrylic 5-Piece Shell Pack is a DW kit through and through. From the newly-designed mini Turret lug, to Remo USA-made Suede "outline" logo heads, to a sleek silver and white badge, its looks are fresh and decidedly familiar. Custom-inspired features also include STM (Suspension Tom Mounts), True-Pitch Tuning, MAG throw-off, low-mass die cast claw hooks, and more.